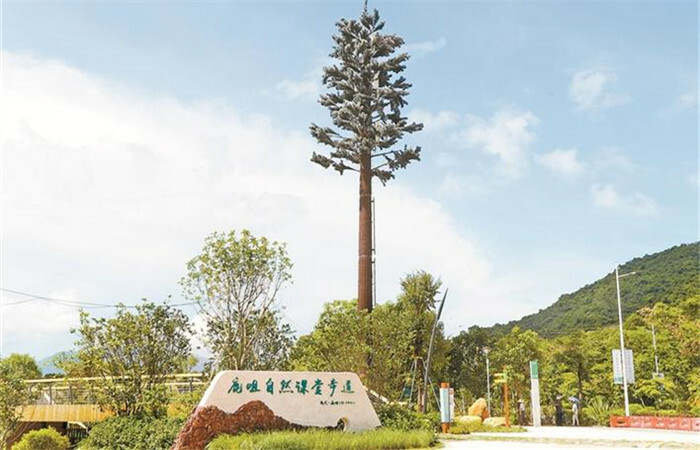 A greenway stretching from Xinda to Luzui in Dapeng New Area recently opened to the public, providing not only a new place of leisure for residents but also a venue for natural science classes for young students, the Shenzhen Special Zone Daily reported. A greenway stretching from Xinda to Luzui in Dapeng New District recently opened to the public, providing not only a new place of leisure for residents but also a venue for natural science classes for young students, the Shenzhen Special Zone Daily reported. The Dazui Greenway has been chosen as the venue for the “second class” program for students in Dapeng. Students will make regular visits to learn nature-related knowledge and protect the ecological environment, according to the report. Residents can scan the QR codes on more than 260 signs positioned along both sides of the greenway to acquire a variety of background knowledge about the animals, plants, geography and astronomy in the surrounding areas in different mediums including text, audio and video. A resident from Luohu District, identified by his surname Li, told the Daily that traveling on the greenway can not only boost one’s mood but also impart abundant knowledge about nature. Additionally, a mobile app has been developed to make the learning experience hassle-free, which supports an audio lesson for visitors that plays automatically upon arriving at different locations with the help of GPS technology. The reasons behind making the greenway Shenzhen’s first footpath for natural science lessons included the fact that the areas along the greenway boast charming sea views and rich biodiversity, the report said. Data suggests that the area along the greenway is home to over 1,600 species, including around 500 types of animals like heron and leopard cat, and 1,100 kinds of plants such as coral and mangrove. “A textbook on the greenway has been published,” said a staffer with Dapeng’s construction work bureau. The construction of a second nature education footpath in Dapeng has been launched at Xichong. There will be a total of 10 footpaths of this kind in Dapeng in the future, the report said.